November | 2014 | LIT.GAZ. I scored a great bargain about twenty years ago when I go a copy of the Daily Telegraph Atlas as published in 1919 – a veritable time machine with an almost unrecognisable Europe and a completely unrecognisable rest of the world. Beautifully produced, it make the Times Atlas look small. Some years ago Taschen, the German publishers, reproduced a large selection of Joan Blaeu’s Atlas Maior of the 1660s, and I couldn’t resist that! You can see the world part way through Western white man’s discovery of it; the engravings are beautiful. the illustrations and decorations – especially in the unknown parts of the world – magnificent. I turn the pages and wonder. You would expect an ex-English teacher to have something to say about Shakespeare…I treated myself to a reproduction of the First Folio of 1623, and I love to look at my favourite plays and read the speeches in that antique font, the old style ‘s’, the ligatures between ‘c’ and ‘t’. It’s an object of great beauty and fascination, and whenever I’m in London near the British Library I go in to see the real thing, and shivers run down my spine. I’ve written enough about desert travel in this blog for no-one to be surprised that I have several books of stunning photographs of deserts in various parts of the word. I prefer my deserts without people; I don’t mind close-ups though I think I prefer panoramas, and I’m still amazed at the variety of landscapes, rocks, colours, since the immediate association with the word ‘desert’ is usually ‘sand’. As I’ve grown older, I’ve begun to explore the world of art more deliberately, and to learn a little. I like exhibitions, when I can get to them, and galleries when I’m on my travels, and books of reproductions when I’m unable to do either. I can gaze in wonder upon Turner’s oil paintings and watercolours happily for hours. I did not realise my luck in seeing my favourite of his, Modern Rome, at an exhibition in Edinburgh before it was snaffled by the bottomless money-pit that is the Getty Museum in the US. And large tomes of Monet, and Kaspar David Friedrich are also on the shelves, and often off them. So, I’ve revised the opinion I expressed a few days back, because this volume is surely Bradbury’s masterpiece. In places the language verges on the poetic, in other places he is still mawkish and sentimental, but the overall achievement is marvellous. And the foolishness of our race knows no bounds – the war which everyone feared in the 1950s comes to pass, and the humans on Mars watch in horror as they see Earth glowing with nuclear war, and then all dash back patriotically to do their bit, leaving only a few lonely souls behind, to be joined by some who are sensible enough to flee the ruins of Earth in the hope of starting a new life. The story August 2026 There Will Come Soft Rains is wonderful. It is very much a piece of its time. It’s barkingly unrealistic, beautifully lyrical, and a powerful allegory about many of the things that are wrong with our world. If anything of Bardbury’s oeuvre survives the test of time, it deserves to be this. A collection of short stories, which I’ve reread, trying to work out whether I really rate him any more. There are some surprises here – an eye-opening glimpse into the race-relations issues in the 1950s US, and a very prescient story which seems to address today’s issues about omnipresent and intrusive social media communications. Then there is the very famous time-travel story, The Sound of Thunder, which explores the idea that going back into the past – if it were possible – would be very dangerous, because of the possibility of a chain-reaction in changes to that past. I shan’t say any more lest you haven’t come across this story, which is one of the classics of the genre, and has been anthologised many times. Bradbury is big on Mars – we need to remember that the Soviet Union hadn’t launched the first space craft when most of these stories were written – and the possibilities of colonising another planet and emigrating to it. He links this in to the old frontier days of the early United States. 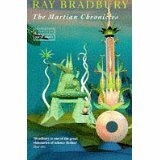 I’m planning to read his collection The Martian Chronicles next, as my final catch-up with him. There’s an awful lot of dross, though. Stories written by the word to make money, published in long-dead magazines, with magic, witches and the twee-ness of small-town American life presented in a very saccharine or maudlin manner. And then there’s the Cold War, always lurking in the background, always ready to leap into Hot War unexpectedly. This last is a more convincing and genuine recurrent theme, though others have developed it better, I feel. I’m beginning to feel that Bradbury is now a name to which readers pay reverence as a pioneer of the SF genre, and the SF story in particular, without necessarily being all that familiar with much of his work, and that he will eventually fade into obscurity. Coming back to this story of the reluctant death of a king who has always refused to come to terms with its inevitability is obviously very different, given that I’m rather closer to that possibility myself than I was way back in 1972. The metaphorical meanings were clearer, for a start: it’s the death of a king because everyone (Everyman?) is at the centre of his/her own universe, solipsistically: everything revolves around us, from our perspective, and no matter how significant we imagine we are, we must eventually let go of that importance, that permanence, and fade into insignificance. The king is aided and tormented by his two queens, one rather matter-of-fact, insistent on the necessity of what must happen, in a no-nonsense way, and the other representing attachment, to people and objects, all of which must be let go of… The interplay between acceptance and resistance is at the heart of the drama, as it surely is at the heart of the human condition, cruelly inevitable. What attracted me to the play way back then – the absurdity which breaks through, which jars, which shocks us into new ways of seeing and responding – is just as powerful to me now. We create the meaning to our life if there is one, and there is another perspective from which it is absurd, a tale told by an idiot, signifying nothing. ( Ionesco later wrote a version of the Scottish play, too). I wondered then, and felt that the play was a tragedy, no easy thing to write in the godless twentieth century, and I still think so. Perhaps there isn’t a so much of a sense of tragic waste, but there is a sense of loss at the end as everything gradually vanishes and collapses around the dying king. I spent quite a bit of time thinking about the title, which is a sort of play on words which cannot really be translated into English – the rather banal ‘Exit The King‘ doesn’t do it justice. The point is that the verb ‘mourir’ – to die – in French is a normal verb, whereas Ionesco makes it a reflexive verb, one of those curiosities which drive English learners of foreign languages to distraction; it’s on the same level as other things that one does for oneself, like getting dressed, sitting down, cleaning one’s teeth, so to make the verb ‘to die’ a verb like those others, gives it an extra edge: to die in himself? for himself? to himself? And, I have always found a great profundity in the line from the play (translated here) “Everyone is the first person to die.” Think about it. It’s that time again: reading for the Russian literature group. I taught this play to drama students a number of times, and it was a challenge, because it’s so boring. Today I had a (small) revelation: it’s a nineteenth century version of Waiting for Godot. Once I had it in that viewfinder, it began to be rather more approachable. 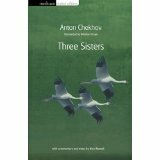 The sisters in this play are stuck in the middle of nowhere – there’s a hell of a lot of middle of nowhere or back of beyond in Russia – if they work, their jobs are drudgery, and they have set their hopes of a new and more fulfilling life on getting back to Moscow, which they left thirteen years previously. In the same way, Vladimir and Estragon expect the arrival of Godot to change their lives, to bring some kind of meaning. The male characters in Three Sisters are utter wasters: a drunken doctor, a military man who resigns, threatens to go and do meaningful work eventually, and then is killed in a pointless duel the day before he is due to marry one of the sisters and start work. Another soldier ‘philosophises’ all the time (rambles pointlessly about inconsequential ideas) whilst conducting an affair with the married sister. Eventually the troops leave… and nobody goes to Moscow. It seems an allegorical play – if there is any fathomable meaning to it – Russia is stuck in a time-warp, its people lack purpose, meaning to their lives; those with brains and ideas are idle and unproductive. That’s not to say that Chekhov was a revolutionary or that he was prophesying events twenty or so years in the future. But I do get the sense of a world that has lost its way here. (No change there, then, said he cynically.) Nobody is happy, even when they say they are. I think Beckett does it better: I think the absurdity comes over more clearly and powerfully. But the end result is the same. And I suppose both plays can be looked from the perspective of tragedy: we were challenged a number of times at university to discuss and imagine whether tragedy was possible in the twentieth century. I always felt that Beckett achieved that sense of tragic waste in Waiting for Godot, and now I think that perhaps Chekhov does, too. There’s certainly some of the ‘there but for the grace of God go I’ in the plot, but I cannot really warm to any of the characters. To this outsider, there’s a powerful insight into the Russian soul. Well, I never imagined I would describe a book about sheep farming in Argentina as fascinating, but this one certainly was. First off, since I moan so frequently about maps in travel books, I will acknowledge that the maps in this volume are excellent: clear, and a decent scale. Obviously they were taken from the original 1948 publication of this book. 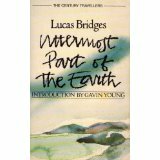 I’ve never really understood Christian missionaries setting off to prosyletise in the back of beyond either, but they often write very well about the people and places they encounter, and The Uttermost Part of the Earth starts with the author’s father establishing the first mission to the pagan tribes of Tierra del Fuego, on the very tip of South America. The tribes, the Yahgan and the Ona, are primitive and savage, and in the end not terribly interested in Christianity – they seem to have no gods or religion at all, only some superstitions and rituals – and the father gives up being a missionary, but raises his family and develops settlements where life is hard, sheep are raised, the land is gradually settled, and in some ways the lives of the natives are improved. However, the writer acknowledges that the encroachment of the white races, as Argentina and Chile gradually claim and fill up their territories, leads to the inevitable extinction of the tribes. The writer, however, is increasingly fascinated by the natives, learning their unbelievably complex languages, and sharing their lives, habits and rituals, often risking life and limb as he becomes unintentionally embroiled in some of their internecine feuds. He grows up among them and knows no other way of life; he relishes the adventures and takes all the hardships in his stride as a young man. He describes the lives of the settlers and the tribes in great detail, and, for someone writing about events over a century ago, is very open-minded and non-judgemental about what he encounters. At this level, the book becomes quite compelling, and once again I had the feeling of real explorers (Europeans, yes) discovering somewhere and exploring it for the first time, enduring genuine hardship and privation when they could have been somewhere a lot more comfortable. Clearly, you can’t avoid the ‘what on earth are Europeans doing there anyway?’ and the issue of colonialism and its deleterious effects. The writer’s father spent years compiling a dictionary of the Yahgan (or Yamara) language, which was stolen, pirated and didn’t actually see the light of day for over fifty years. Fascinated as I am by weird languages I went straight to the bizarre Christus Rex website, which is the best place I know of to see examples: they have versions of the Lord’s Prayer in about 1700 languages, and sure enough there it was… further research was rather chilling, as one of the two languages (Yahgan and Ona) was listed as extinct, and the other, in 2013, had only one living speaker. As I started off by saying, I was rather more touched and moved by this book than I expected to be. I can’t off-hand remember how many times I’ve taught this text to sixth-formers. After a few years, I’ve come back to it, in order to write a study guide. As always, there is something new to notice, even when coming back to a text one is very familiar with. For a novel that’s been around for thirty years or so, and can be described as ‘speculative fiction’, it’s dated remarkably little; many of the ideas that Atwood found already part of society when she was writing are still evident. Certainly it reads more convincingly that, for instance, Nineteen-Eightyfour thirty years after that novel was first published. Offred’s story – that of a woman in the newly established Republic of Gilead, in the eastern part of the former USA, a fertile female assigned to a deserving male for breeding purposes – still has the power to shock, but, more importantly, to make the reader reflect on so many aspects of the power relationships between men and women in society. However, it was not this aspect of Atwood’s novel that spoke most strongly to me this time around. The tone of the narrative is marvellously developed and sustained: Offred tells her story is the first person, experiencing, feeling and describing, with even her dialogue and that of others subsumed into the texture of her narrative, partly by the very simple device of not using inverted commas to demarcate any speech. This reinforces the timelessness of her story, in which most of her life is just waiting around, frittering time away, being bored, and being tormented by her memories of her past. She is intensely focused on words, language and meaning; she tunes into plays on words, definitions, shades and changes; even her illicit nighttime encounters with her Commander are filled with games of Scrabble… the time she has on her hands, this superfluity, adds an almost poetic quality to her narrative. It’s highly effective, helping draw the reader more deeply into Offred’s tortured being. The second thing that struck me even more forcefully this time was the cleverness of Atwood’s narrative structure; the layering of the stories reminded me more than once of Shelley‘s Frankenstein. This deliberate – and oh so subtle – shifting of our perspectives and opinions nudges us in the direction of realising the complexities of the sexual-political issues Atwood is exploring via Offred’s experiences. And Atwood offers us no easy answers; it’s no strident feminist diatribe with all men as the enemy, and the deficiencies of our own society are as much under the microscope as the horrors of the Gileadean future. In the end, for me the crux is the human desire for intimacy with another, and what becomes of that intimacy. Atwood has written a novel which will stand the test of time as well as or better than other dystopias of recent years, and which will not lose the power to make its readers think deeply about themselves as well as their world.